Boots on the Ground is a group of dedicated, retired and serving First Responders who work together to provide confidential peel support, available 24/7. Boots on the Ground is a non-profit organization completely run and staff by volunteers. Participate – Register to participate in the event and start raising pledges today. The head shave event takes place yearly in April at Square One Shopping Centre in Mississauga. If you are interested in participating please send an email to copsforcancer@peelpolice.ca. Run a community event of your own – Every year we have companies, schools, community groups all helping us to reach our goal. Events such as golf tournaments, BBQ’s, car washes etc are run year round in support of this great cause. Badge of Life Canada is a peer-led national non-profit volunteer organization committee to support police and corrections personnel who are dealing with psychological injuries suffered in the line of duty. Their primary focus is on providing assistance and information to active/retired and sworn/civilian personnel, within the following organizations across Canada: First Nations Police, Municipal Police, Provincial Police and Corrections Personnel. 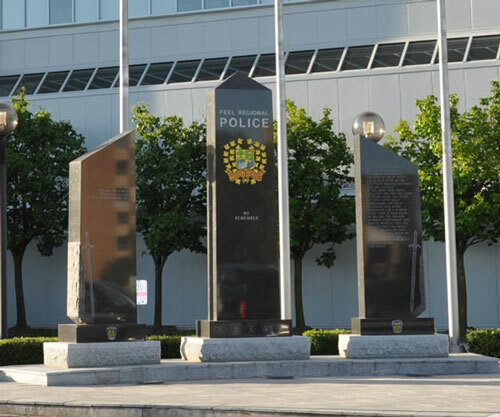 The Peel Regional Police Association has a long standing tradition of support to Canadian Veterans through donations and the purchase of memorial wreaths for the Royal Canadian Legion branches in the Region of Peel. Our members attend, representing the Peel Regional Police Service at ceremonies across the Region. There are many veterans’ organizations in Canada but the largest by far is The Royal Canadian Legion with more than over 400,000 members and affiliates. The Legion is a non-profit, dues-supported, fraternal organization with approximately 1,600 branches in Canada, 21 in the United States and 4 in Germany. The Legion receives no financial assistance from any outside agency and membership is open to all Canadian veterans as well as serving and former members of the Canadian Forces, RCMP, The Royal Newfoundland Constabulary, other police forces and their dependents, and Canadians who subscribe to the purposes and objects of the organization. The Royal Canadian Legion has assumed a major responsibility for perpetuating the tradition of Remembrance in Canada. Each year the Legion organizes and runs the National Poppy-Remembrance Campaign to remind Canadians of the tremendous debt we owe to the more than 117,000 men and women who gave their lives in the defence of Canada during two World Wars, the Korean War and other missions around the world. Contributions made during the campaign are used to assist needy veterans, ex-service members and their families. The Legion also supports programs for seniors, particularly through direct community-level activities, and housing projects. The Legion’s Youth program provides scholarships and bursaries, sports programs and support to activities such as cadets, scouts and guides.